I was on my way to meet my friend for lunch at a local café down in the shopping district of town. We hadn’t seen each other for a long time and I was so eager to see him that I realized I was very early for our date. Deciding that it would be silly to go sit in the restaurant for an hour, I parked the car and walked into town, so I could browse the shops. Maybe I’ll get him a gift, I thought. I passed the familiar establishments: the bakery, the antique bookshop, and the one with the handmade chocolates. I peeked in the windows, but nothing caught my eye. Becoming bored, I decided to make a short cut to the other side of the street down a narrow alley. I stepped around the trash cans and navigated a dumpster. I stopped short. For a moment my head went all swimmy. I closed my eyes, wondering if I might faint. My heart rate slowed. I felt a trickle of perspiration go down my spine. I opened my eyes. The hazy alley now went on infinitely in both directions. Thinking that possibly I was dehydrated , I walked for a few steps in the direction I was already going hoping to find a shop where I could ask for a drink of water. Almost as soon as I wished, I was in front of a tiny shop entrance, set in a stone wall. It hadn’t been there a second ago. 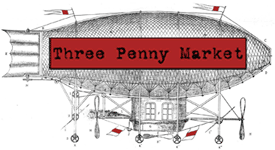 The hand lettered sign on the red door said Three Penny Market. Steam was pouring out from under it. 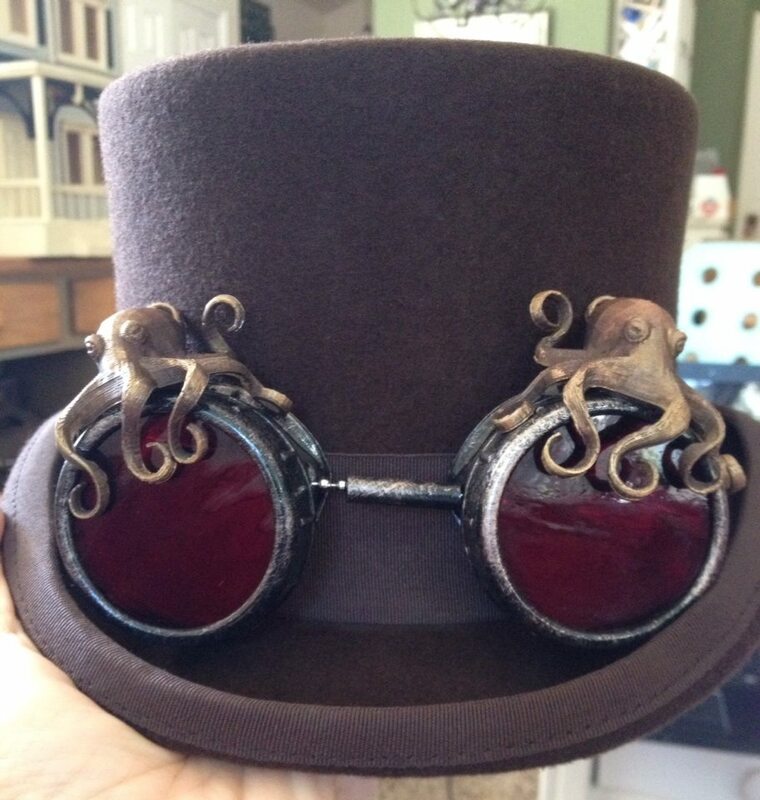 The window showcased inexplicable things- pendants that glowed like stars in the fog, arcane machinery covered in pipes and gauges, top hats and parasols and faded flags. I opened the door tentatively. A cloud of steam swirled out to greet me. I received an impression of rows of shadowy shelving with items on them, presumably for sale. Shoes and sealing wax and cabbages and kings, I thought. The whole place hummed in a way that I could feel inside my chest. Through the droplets clinging to my eyelashes I noticed objects from a variety of time periods and genres. Was this an antique shop? It had that antique shop feeling, of age and dust and benevolent neglect, but something was off. Over in the corner were some things with lights on them that looked vaguely like computer equipment, but where the keyboard should be there was an ancient black typewriter with shiny round keys. I absentmindedly shifted some hangers on the racks of period clothing. What was I looking for? I knew I had come in here for a reason. I gravitated toward a display hung with shiny goggles and noticed I was at the main counter. I rang the service bell. It seemed to be the right thing to do. A woman came out from the back. She had on a dozen skirts all hitched up in various places with a long chain draped over the top of the layers. The chain had keys, watches, and tiny tools like scissors and even a spoon all hanging off it. As she passed through the doorway, I briefly saw a vast workshop behind her, where a peculiar whiskered man in a pith helmet was hammering furiously on some sort of machinery that seemed to be producing the quantities of steam. I had a glimpse of a huge turbine with vast gears. That’s what is causing the humming, I thought, whatever is going on in that secret lab. The woman asked, “May I help you?” and I turned my attention to her. It was hard to determine her exact age- she had long reddish brown hair and rosy cheeks, but her eyes crinkled in way that said she had seen the back of many years. They were odd eyes that seemed to change color as she cocked an eyebrow at me. “Zombies are pretty active lately, you can never be too careful.” Her expression was wry, maybe she was teasing me? She started banging some models on the counter for me to examine. Before I knew what was happening I had purchased a steam powered zombie pistol, a black top hat with raven’s wings on the sides, a pocket watch with exposed gears, and a pair of spats. I mumbled some thanks and drifted back to the red door which closed behind me in puff of steam. When the door clicked shut, it was like the snap the hypnotist uses to wake you up out of a trance. I stood blinking in the ordinary alley with the dumpster. The shop was nowhere to be found, and I have never seen it since. But I still have my gun, just in case the zombies act up. You can never be too careful. It’s been the week of goggles, and we’ll be taking a bazillion pictures of them this weekend, but here are a couple of our favorites! I wonder who would win in a fight, Abe or an octopus? Check back soon for more goggle goodness, or follow us on Facebook, Twitter or Etsy! This weekend’s project – making goggles! We make our goggles from “scratch”, cutting lenses, hand painting them, and coming up with original designs. Come visit us at Salt Lake Comic Con, booth # 1933 and see them for yourselves! 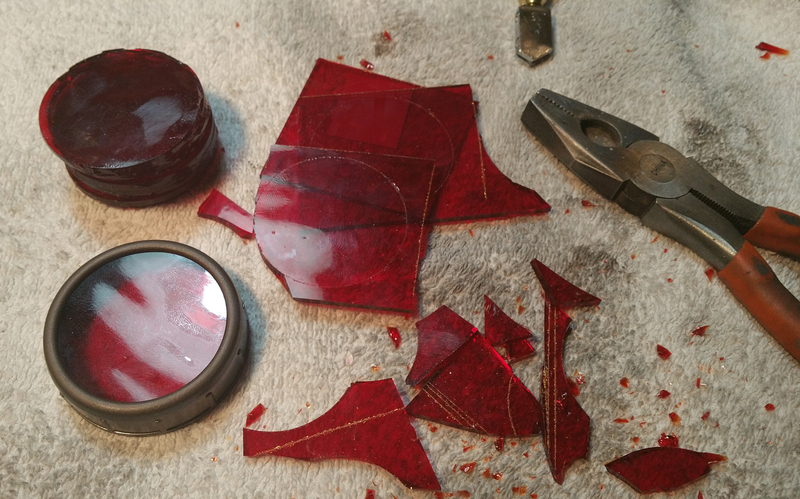 Cutting glass – not fun for the fingers, but worth it for super cool goggles!! http://www.threepennymarket.com/wp-content/uploads/2015/05/new-airship-150.png 0 0 T.J, Schmitz http://www.threepennymarket.com/wp-content/uploads/2015/05/new-airship-150.png T.J, Schmitz2015-08-25 16:30:442015-08-25 16:31:38New Goggles! Here are our latest guns and goggles – fresh from the workshop!